To celebrate the publication of the 50th MagPi magazine, the Raspberry Pi Foundation has created a special edition which is packed with 50 of the greatest Raspberry Pi projects, 20 of which have been voted in by the Raspberry Pi community. The Raspberry Pi Foundation explains a little more about what you can expect to findIn the latest 50th publication of the official Raspberry Pi MagPi magazine. Rob from The MagPi here! 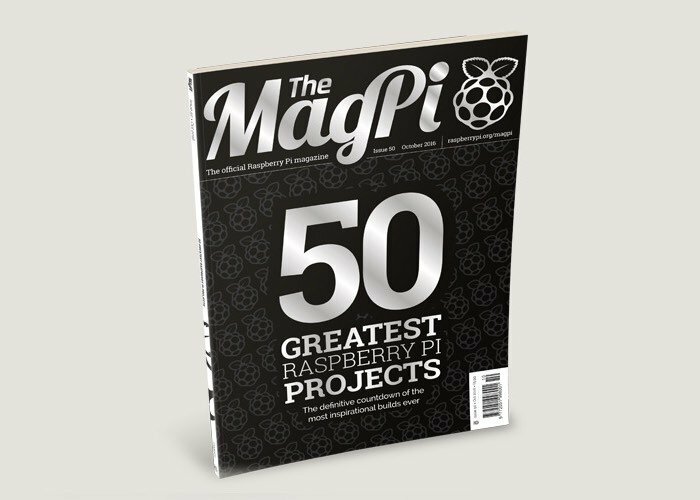 We’re absolutely thrilled finally to be able to share with you The MagPi 50, our landmark issue with a super special feature on the 50 greatest Raspberry Pi projects of all time, the top 20 of which were voted on by you, the Raspberry Pi community. As well as the thousands who voted, we had a panel of judges choosing the best projects in a few special categories. Eben Upton, the man behind Raspberry Pi, gave us his picks of software projects. Philip Colligan, CEO of the Raspberry Pi Foundation, carefully selected some incredible humanitarian projects. Liz Upton, Director of Communications/my boss, made some tough decisions in the young makers category. Finally, Michael Horne and Tim Richardson of CamJam and Pi Wars fame presided over the Pi robots. Hopefully your favourite project made its way into the top 50! It was a hard task whittling it down to this number, and to be perfectly honest we could probably feature another 50 projects next month that are equally good. The Raspberry Pi community has done some incredible things over the last four years and change, and I’m immensely proud that we can share some of the outstanding work you folk have done in this issue. But wait, there’s more! As well as our big community celebration, we also have our usual selection of excellent tutorials, news, and reviews. If the reveal of USB and Ethernet booting on Pi 3 piqued your interest a few weeks ago, we have a full eight-page guide on how you can do that yourself. We cover the #10MillionPi event at the Houses of Parliament in the news, along with some wonderful Raspberry Pi-powered tech that’s being used in the health industry.